All the goodness of Eggs Benedict without the fuss. It’s a basic strata recipe but instead of plain old bread you use English Muffins…now how clever is that? I love ‘combo-foods’. Hybrids if you will. Like Peach Cobbler Muffins or Chilies Rellenos Casserole. Where you take a couple really good things and morf them into one delicious dish! This Eggs Benedict Casserole is my fave so far! 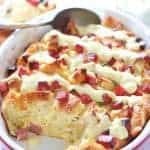 This eggs benedict casserole does require some sitting time for the english muffins and egg mixture to become one. 4 hours will do it, or overnight…even better! So lets chat about the Hollandaise. I cheated…I did, I said it and I’d do it again! I used a package mix by Knorr. I dolled it up with a squeeze of fresh lemon and a couple tablespoons of cream cheese and it was lovely. I actually liked it better than my homemade and it held up well with this casserole. I’ll share the homemade recipe but if you are in a pinch. Buy the package mix. Just make sure it’s Knorr brand (no compensation from Knorr…I just like their product). I’ve tried the cheaper brands and they are really, really bad. Canadian Bacon vs. Ham – I like the Canadian bacon best, but it can be pricey. Ham is a great substitute for this casserole. You can buy it already cut in cubes. If you use Canadian bacon, try to get the thickest cut you can so it doesn’t get to crispy when cooking. Another great brunch recipe is my Mexican Breakfast Casserole! Tortillas soaked in eggs and cream with sausage and chilies – yum! Or something a little sweet? Blueberry Cheesecake French Toast Casserole with a super easy blueberry sauce! Eggs Benedict for a Crowd! 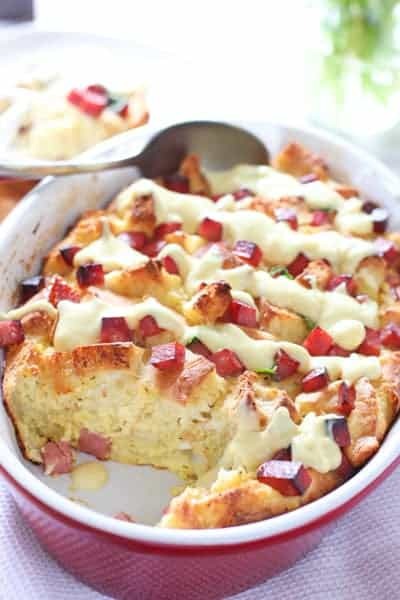 An overnight easy to make brunch casserole thats easy on the cook! In a large bowl, whisk eggs, milk, salt and pepper. Pour over top of english muffin and bacon. Cover with plastic wrap and refrigerate 4 hours or overnight. Remove casserole from refrigerator to sit on counter and warm up a bit. Remove plastic wrap and cover with foil. Bake 35 minutes. Remove foil and bake 10-15 minutes longer or until a knife inserted near the center comes out clean. In top of a double boiler or a metal bowl over simmering water, whisk egg yolks, cream, lemon juice and mustard until blended; cook until mixture is just thick enough to coat a metal spoon and temperature reaches 160°, whisking constantly. Reduce heat to very low. Very slowly drizzle in warm melted butter, whisking constantly. Serve immediately with casserole. Could you substitute smoked salmon for the ham? Even by putting it on at the very end so the casserole warms it up? Hi Catherine – I am the worst person to ask. I don’t like smoked anything so it doesn’t sound very good to me. I think it might be a bit oily too? You could leave the ham off and serve a few slices of salmon on the side – that might work? I made this for Easter and plan to make it tonight for 4th of July morning. My husband insisted I toast the english muffins before and I guess that worked, otherwise followed directions exactly and used one Knorr packet. Delicious! Funny you would mention the toasted english muffins. The original recipe required them but I got lazy (big surprise) the second time I made this and didn’t toast them. Couldn’t tell the difference so I took the low road 🙂 Your hubby is right on! 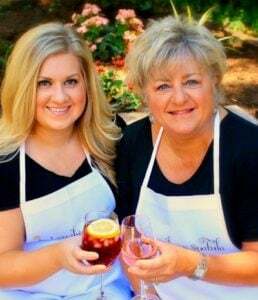 Glad you like the recipe and the packaged Hollandaise! Its surprisingly good! I am an eggs benny fanatic and found this recipe on TOH a few years ago. I’ve made it numerous times since and it’s always a hit. I always use regular bacon but sprinkle it on top just before baking so it stays crispy. Please don’t recommend the packet Hollandaise!! This recipe for it is AMAZING!! And surprisingly easy!! I’ve doubled and even tripled it for a larger crowd and it always turns out well! Hi Jackie – I have to recommend the packaged Hollandaise but only Knorr brand. -I kinda love it. I’ve been whisking it up for years in a pinch. If you add a glob of cream cheese and a big squeeze of lemon it is really good. Especially for those who are scared of making their own. I love your idea of regular bacon! Hi Patty – I have never frozen it but my best recommendation would be no. It’s an egg custard so I see mushiness if it’s frozen. This was delicious and so easy. The only change I would make next time is to add spinach and mushrooms. There’s no better way to celebrate Easter than with a great brunch menu. This looks perfect for entertaining. This sounds great – and perfect for an Easter brunch!